The Add/remove users screen is displayed when you use this command on the Tools menu. The list of users currently included in the User List, in addition to the Default user account. 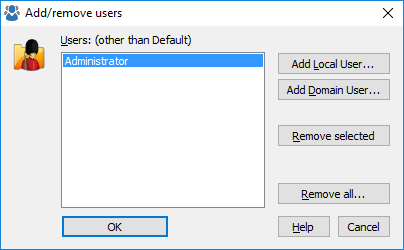 Press this button to add a new name to the User List by choosing the name from the list of the local users of your computer. Press this button to add a new name to the User List by choosing the name from the list of the domain users (if your computer is connected to a domain).